Standing Desks: Does it really increase productivity? Stand-up desks are becoming more than a trend in 2015. They are actually the new norm with both startups, and long established companies. But what about the claims that stand-up desks promote office productivity? This article will help separate the actual facts, from the hype, about stand-up office desks. Stand-up desks and their reputation for increasing productivity, relates to the human subconscious. It has to do with the way the mind and body perceives work, and what it considers work. When someone is too comfortable in their chair, and their standard office desk, the mind and body relax and they start to wander and lose focus - and then productivity starts to suffer. Large companies have been catching on to this inherent psychological fact, with successful corporations like Google, and Facebook, utilizing stand-up desk arrangements in their offices, in order to counteract the actual counterproductive effects of being overly comfortable at work. 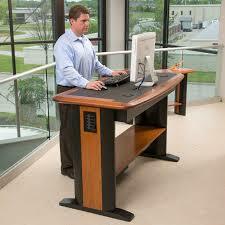 Adjustable stand-up desks allow for both sitting and standing. This way, one can pick and choose how they want to work. When someone is tired of standing, they also have the option to take a short break by sitting down and taking a load off their feet, and conveniently lowering the desk to the proper height. When they feel that they are getting too comfortable and losing focus, then they can easily adjust their desk back to a higher standing position. This convenience is a comfort to anyone who has had reservations about standing while working at a desk. Adjustable stand-up desks also accommodate all body statures, adjusting to the perfect height for the individual worker. All standard office desks fail to compete with these features when compared to modern adjustable stand-up desks. One of the most commonly heralded pluses that office managers have to say about stand-up desks is that they keep the employee energy flowing in the workplace. Stand-up desks also help to relieve the potential health issues that sitting all day at a standard desk can potentially cause, such as the increased risk of heart disease, obesity, and back pain. This helps office productivity in the long run, with less lost working days due to illness or injury. According to CBS News, a 2015 study by the Annals of Internal Medicine found that too much sitting can raise one’s risk of death, even if they exercise when not at work. Some of the benefits of stand-up desks in the workplace: 1. Alert and more focused energy when standing. 2. Longer stamina when it comes to concentration. 3. Lower anxiety levels when standing. 4. Better posture due to less slumping. 5. Less headaches, backaches, and health problems from prolonged sitting. Schools have also recognized the learning benefits of stand-up desks to children, when they use them in the classroom. Dr. Mark Benden, associate professor at Texas A&M Health Science Center School of Public Health, published a study in the International Journal of Health Promotion and Education, stating that he found a 12 percent higher on-task engagement when the children were using standing type desks rather than standard desks, which equated to an extra seven minutes per hour of engaged instruction time. This does not of course mean that parents should demand that their children stand all day at school, the children still had chairs as an option when they were tired of standing. Throwing the chairs out of school or work would be a ridiculously poor choice. Giving workers an option between standing and sitting is a more rational and effective way to enhance both office morale, and productivity. A choice between a stand-up desk and a standard desk should not be a choice of either standing or sitting all day, but a choice of doing either when the situation or project warrants it. A stand-up desk gives one more options that a standard desk, plain and simple. That is an indisputable fact that no study can disprove. Common sense dictates that a happy medium between the two is going to be the healthiest and most productive method at the office. This is a fact that commonly gets overlooked in the ongoing debate on the merits of stand-up desks or standard desks. What should be held in focus is what is best for the business and its employees, depending on what their working style is, and their individual traits and habits. A stand-up desk cannot be forced, it must be preferred. The trouble with all the ongoing studies regarding standing vs. sitting at work is that they constantly contradict each other, regardless of how reputable the source is. CBS News has recently now reported that after a new study released by the University of Exeter, and University College London, that sitting is not as dangerous as past believed, in fact, that standing is as equal in health risks as sitting is. Once again, this is where common sense has to prevail in this debate. So many conflicting studies have confused the real issue of what is a right fit for both the business type, and the office worker as well. It should be noted, though, that the above UK study was one of the most extensive and lengthiest studies on the health issue of standing vs. sitting, to date. It encompassed 5,000 study subjects over a period of 16 years. It should be noted also that the study did not focus on the productivity issue whatsoever. The best piece of advice for potential new stand-up desk recipients, or standard desk holdouts, is to continue to keep mobile regardless, take mini-breaks and allow for the proper rest in one’s off times. This will reduce the health risks of prolonged immobility, and also increase both a workers’ concentration and productivity.